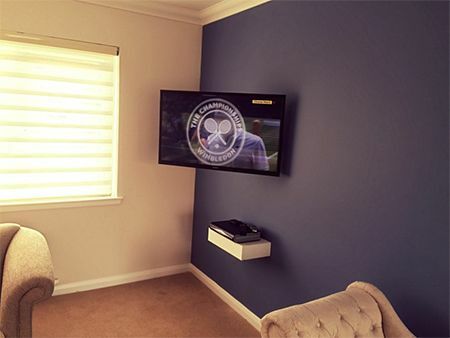 Redline Electronics are a local family business specialising in TV Wall Mounting in South & North Lanarkshire. We are specialists in hiding cabling in any type of wall, where others cant we can. All Engineers are fully checked with disclosure checks, fully trained and qualified and have at least 10 years experience. We supply and install all types of brackets from small flat brackets to large tilt and swivel brackets. We will install power sockets, Aerial / Satellite cabling, long HDMI cables, speaker cabling and even mount your shelves. We are proud members of checkatrade.com and have over 80 reviews rated 9.9/10 and over 150 reviews online, in fact you will not see a negative review about Redline Electronics Ltd anywhere. Click on the Check a Trade logo below to see our great reviews. We are a local registered family business with years of experience. Make sure you visit our gallery page to see the standard of our work for yourself and call or contact us through our contact card to get your fast, free quotation. We understand that most of our clients are interested in getting they're TV on the wall without seeing any cabling at all, so we concentrate on providing a service the is unrivaled at doing this. In any type of wall we will make sure you do not see any cabling even with solid brick walls. 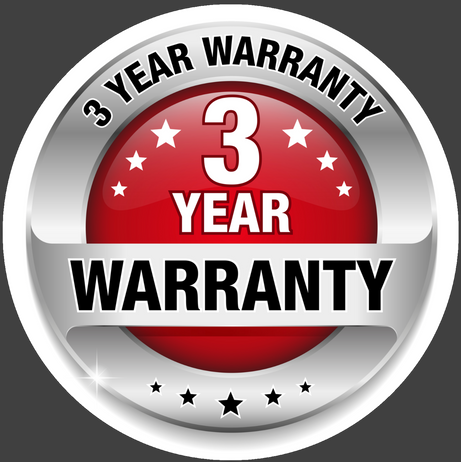 Call us for more information or why not get a free quote and we can explain how this is possible. Having trouble mounting your TV onto the wall? Can’t hide those tricky cables? Let Redline technicians mount your TV and get rid of those ugly cables littering your floor, hiding your cables inside the wall so you do not see any and we install soundbars, shelves or any type of unit you have. Power sockets, brackets and all types of cabling can be supplied and installed. 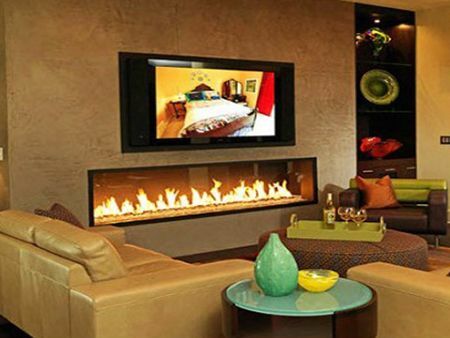 At Redline we can install every thing you require to ensure the best finish in your home. We can install power sockets behind the TV or move existing sockets to hide them better. We can install HDMI cables, scart cables, aerial cabling, satellite cabling, sound/audio cabling for surround sound and even virgin media all inside walls and leave neat finishes. We can provide any type of brackets you require to mount your TV the way you want, from small flat brackets to large 70" swivel brackets. We can mount your shelves, sound bars or even if you have a new electric fire you want under your new TV we can install this too. We specialize in tricky TV mounting work around the Lanarkshire area. At Redline we specialize in tricky TV mounting jobs that most companies would not get involved in. We are specialists in hiding cabling and also viewing boxes. So if you would like your sky, virgin box, DVD or BT box out the way we can help. We have installed boxes in cupboards, behind TVs and even in loft spaces out of sight. 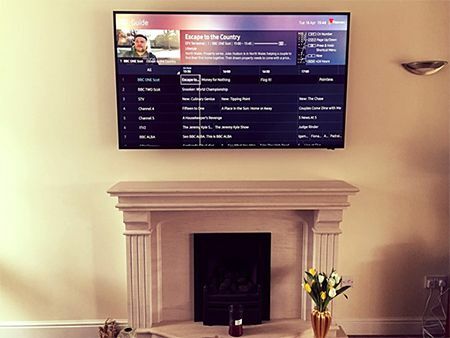 We are TV Wall Mounting specialists working in South lanarkshire, North Lanarkshire, Glasgow, East Kilbride, Hamilton, Motherwell, Airdrie, Coatbridge, Wishaw, Carluke, Lanark, Larkhall, Bothwell, Strathaven, Stonehouse, Lesmahagow, Blackwood, Bellshill, Blantyre, Eaglesham, Law, Chapelhall, Uddingston, Cambuslang, Thorntonhall, Rutherglen, Shotts, Forth, and all surrounding areas.